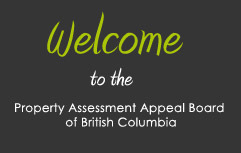 We are the second level of appeal for property assessments in B.C. You must first appeal to the Property Assessment Review Panel. This website will assist you in understanding and preparing for all stages of your appeal with our Board. Click here to view recent announcements.